Want to add an advanced contact form to your homepage? Need to create a poll submitted by users or receive a feedback from your consumers? The SmartFormer Gold Pro Form Builder handles all these issues and provides even more features that make SmartFormer Gold unique on the Magento Marketplace. The easy-to-use SFG editor is developed to create a form literally in a few minutes. 18 available elements and snippets can be easily aligned vertically or horizontally. Design the form layout professionally and change the form behavior using the integrated PHP, JS, HTML, and CSS editors. The extension is a good choice for any user level allowing to create forms from a simple contact to multi-page complex forms. Collect customer data by binding your form to the database. An easy Database Designer tool helps to create a new database table automatically or associate a new form with an existing table. Binding your forms to the database allows to check, edit, or export the submitted information from backend later. Need to validate customers’ phone numbers, credit cards, emails, etc.? The extension provides a list of ready validation rules integrated into each form. All rules are customizable with the ability to add new or edit existing ones. After your customers have submitted the form all submitted information will be organized within the list in backend. 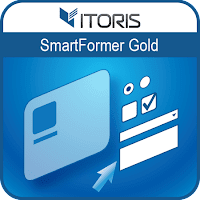 SmartFormer Gold is developed to optimize a huge amount of information with ability to filter, apply mass actions, export to CSV or PDF, and edit data either in backend or frontend. You also get the full control over all customers’ actions including the ability to edit submissions or setting the maximum number of submissions per customer. The extension allows to insert forms literally in any Magento area. You can easily insert forms to CMS pages or Static blocks, publish forms on a separate page or via the XML layout of your theme.